Good morning! Welcome to The Morning Shift, your roundup of the auto news you crave, all in one place every weekday morning. Here are the important stories you need to know so you can one-up the insufferable know-it-alls at dinner. How’s this for a catch-22? 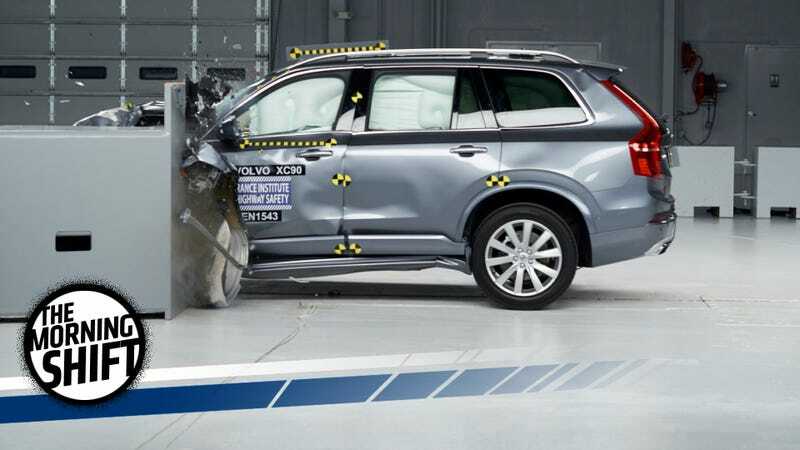 Automakers are including more complicated safety features such lane departure warning systems, automatic emergency braking and more airbags that are intended to keep you safe in the event of a crash, or in some cases, keep you from crashing entirely. But if you do crash, your car’s probably going to get totaled a lot easier, as modern-day safety features are a lot more expensive. In the past, if you had a front-end collision, you had damage to the engine or the front end. But now, with the number of airbags that can run from $1,000 up to $4,000 and all the sensors up front, you’re seeing more totals. The more expensive each component is to replace, the more the total for repairs nears the point at which an insurance company deems your car less expensive to junk than it is to repair. The gigantic Takata airbag recall backlog has thrown another wrench in the system. Insurance companies are more prone to declare a vehicle with unreplaced Takata airbags a total loss in hopes of speeding up that recall process, reports Automotive News. At least salvage auctions and junkyards are making bank on this problem. The amount of vehicles totaled by natural disasters has dropped over the past 10 years, but Americans driving more (with more expensive tech in new cars, no less) has more than made up for it. While Uber is still fighting a lawsuit in the United States that alleges that they stole designs from Google’s autonomous car project Waymo, a new Uber artificial intelligence team is setting up shop in Toronto as part of Uber’s Advanced Technologies Group, reports Bloomberg. Much of Uber’s research will be in conjunction with the University of Toronto-affiliated non-profit Vector Institute for Artificial Intelligence, where Uber is investing $5 million towards researching how its autonomous cars can understand things like traffic cops and color better. One of the university’s AI experts in the field of machine sight and learning, Raquel Urtasun, will lead the project. But how far they’ll be able to get may still depend on the judge presiding over the Waymo case. A preliminary injunction expected to come as soon as next week may halt development of Uber’s self-driving car project, reports Bloomberg. However, it may be limited to the use of lidar hardware components related to the allegedly stolen tech, which would allow the software research in Toronto to go on as usual. Tesla had to turn dozens of engineers away from the event, which was mistaken for an open recruiting even by some. They’re probably looking in the right place, though. Mexico has a deep automotive engineering talent pool with 19 automotive plants at home. This comes against a background of increasing U.S. government hostility towards Mexico and foreign workers, though. Trump wants to review immigration rules for high-skilled foreign workers as part of his push to put more Americans to work. That’s a nice thought, but Tesla’s issues filling these positions at home have demonstrated that nice thoughts aren’t always based in reality. Elon Musk—himself an immigrant from South Africa—sits on Trump’s business advisory council, so maybe he can convince that swamp to let him hire whoever he needs regardless. 4th Gear: Who Wants A Cheap Diesel Volkswagen? The company has 11,000 of those cars up for sale, but they’re moving fast—3,100 of those were sold last month. That’s still down from the 7,400 diesel cars Volkswagen sold in the last month before Dieselgate broke, though, which accounted for almost 23 percent of its sales in August 2015. In a move to redefine itself as a supplier of future technologies, Delphi last week said it will spin off the powertrain operations that have been at the heart of its identity. Instead, Delphi will shift its attention to such emerging fields as software, electronics, advanced safety and electrical architectures. Those are key pieces in the commercialization of autonomous driving and cloud-based infotainment and connected vehicles. It’s no small move, either, as Delphi’s powertrain business accounted for a fourth of the company’s $16.7 billion in revenues last year. But the bold move of splitting off and focusing on future-tech has been viewed as a good move by industry analysts, and Delphi shares rose following the announcement. Neutral: Does expensive tech in cars ever scare you away? I remember not wanting an infotainment screen in my car because I had to park outside a lot and I was worried about it getting stolen back in 2010. What about all of the new sensor-driven features that apparently cost a bundle? Are they worth the price (and the risk of your car getting totaled more easily if they’re smashed), or do you stay away?